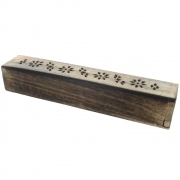 A hand-crafted antiqued wooden incense holder. 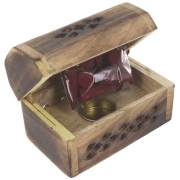 A hand-crafted mango wood mini box cone burner plus 10 incense cones (various fragrances). 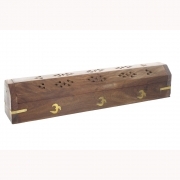 Attractive square, antiqued wooden incense tower. 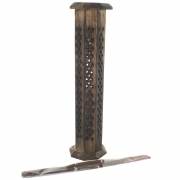 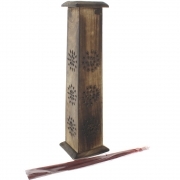 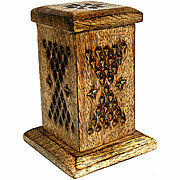 Attractive octagonal, antiqued wooden incense tower. 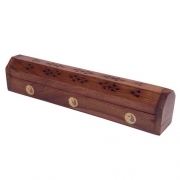 A hand-crafted mango wood incense box burner plus 10 incense sticks (various fragrances). 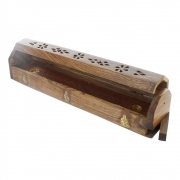 A hand-crafted wooden incense holder with buddha design. 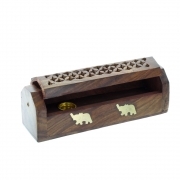 A smaller hand-crafted wooden incense holder with brass elephant inlays.